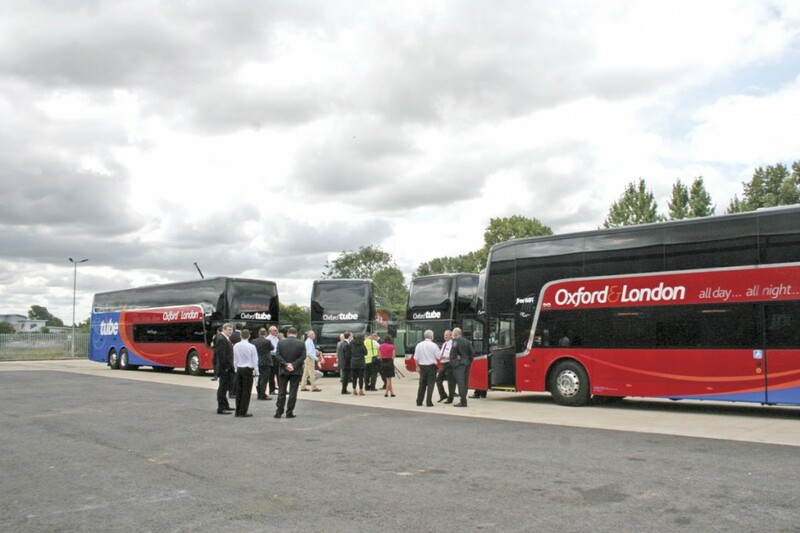 Stagecoach’s new £10m fleet of Van Hool Astromega TDX double deck coaches for its Oxford Tube service represents the largest ever investment in new coaches the company has ever made on the Oxford-London route. Several of the vehicles were displayed at the launch in Oxford, where Chris Peat witnessed the departure in service of the first of them. Boarding one of the Astromegas, it was apparent how true Stagecoach’s claims are that Oxford Tube passengers will be travelling in style and comfort. 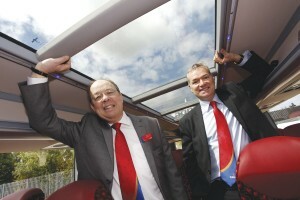 I sat on board one with Paul O’Callaghan, Service Delivery Director for the operator’s Oxford network. Paul’s job rolls the Operations and Engineering Director responsibilities into one. Apparently, he is the only person with such a combined role within Stagecoach. It was a Group decision to go for the Van Hools for the Oxford Tube Service, according to Paul, based on positive experiences of running them in the past. 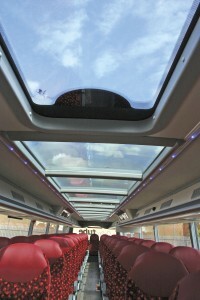 In the UK, the Belgian brand is the product of choice for its coach operations, also seeing widespread use on the Megabus network. In fact, the vehicles the new fleet replaces were Van Hool Astromega TD927s, which have now been cascaded to Stagecoach’s West of Scotland operations. These are five years old and proved ‘excellent’ in service, according to Paul. 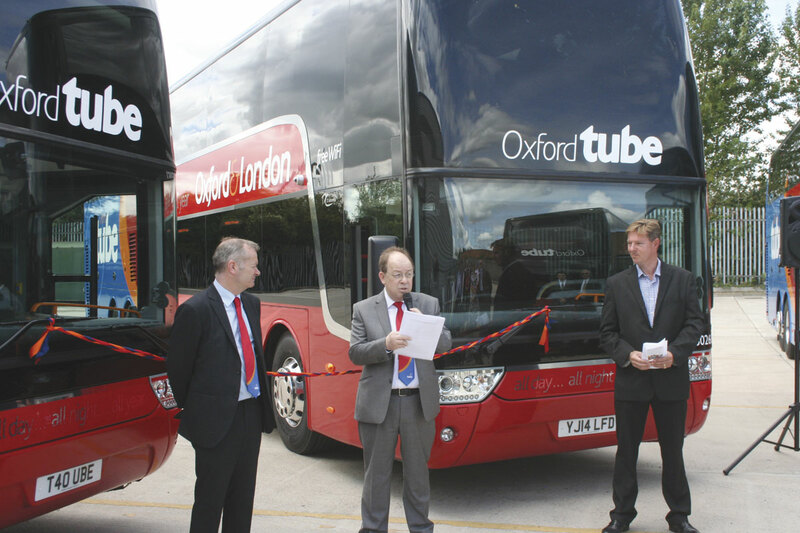 The trend has been to implement fleet upgrades on the Oxford Tube every five years. Prior to the previous Astromegas, Neoplan Skyliners were used on the route and before them were Jonckheere Monacos on MAN chassis which had in turn taken over from single deck coaches, many of them Hungarian bodied Ikarus Blue Danube Volvo B10Ms. The service has been operated since 1987 and was originally launched by Harry Blundred of Transit Holdings, which was subsequently acquired by Stagecoach. One of the main benefits of the new Astromega TDXs is that their DAF/Paccar MX13 engines are Euro6 units. Furthering their ‘green’ credentials is the fact they run on B30 fuel, consisting of 30% biodiesel and 70% standard diesel mix. They develop 462hp (340kW) and peak torque of 2,300Nm. The transmission used is the ZF AS-Tronic AS2301 12-speed fully automated manual and the drive axle is the standard Dana/Eaton G171 single reduction unit with a ratio of 3.07:1. They were supplied through Arriva Bus & Coach. 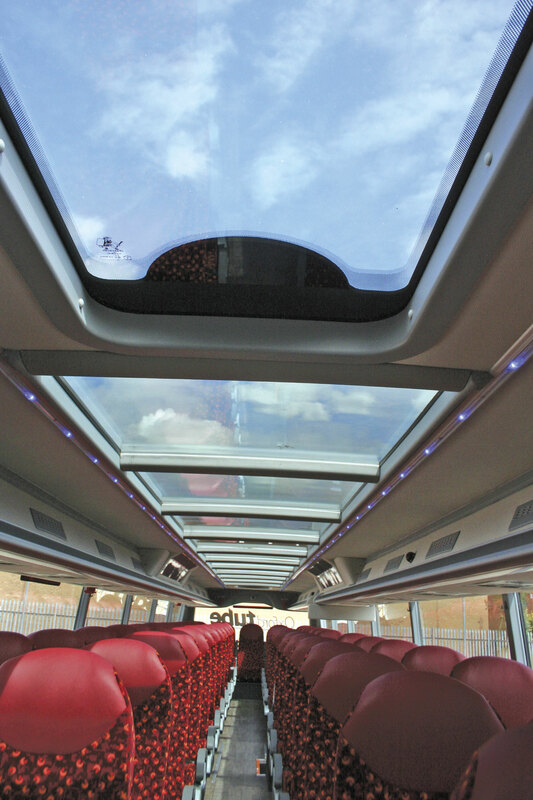 As well as being more environmentally friendly than the previous fleet, the new vehicles have panoramic glass roofs to the upper deck. This is perhaps one of the main things noticeable about the new coaches to passengers, making it brighter inside. They may also notice they have greater legroom now, with the seating capacity reduced from 87 to 81 seats to achieve more space within the 14.205m overall length. More room has been provided for luggage too, with extra racks fitted for more carry-on luggage. Audio visual announcements are provided for next stop and safety announcements. Passengers on the coaches will also be able to benefit from high speed 4G wi-fi during their journeys. USB charging ports have also been fitted, allowing travellers to charge portable electric devices such as tablets and mobiles. All of the vehicles’ equipment was fitted at Van Hool’s Belgian facility during the build process. Prior to going into service, all Oxford Tube drivers had training on the new vehicles. Paul said that even though they had all driven the previous Astromegas, the newer models have slightly different controls. This process was carried out over the past four weeks. ‘Smooth’ was how drivers described the new model, according to Paul, saying they were impressed with the power transition and ride quality, describing it as exceptional. He said the drivers reported the same ride quality with the older models. The new Van Hools all operate out of Stagecoach Oxford’s Horspath Road depot, ten minutes away from the departure area. No changes have been made to the Oxford Tube service. The 24 hour service still runs every 15 minutes for most of the day but up to every ten or 12 minutes during peak hours, with less frequent coaches in the early hours of the morning. Travel times are advertised at one hour 40 minutes, depending on traffic. A mixture of passengers are attracted, from commuters to day trippers, with students representing a good proportion of the patronage too. One of the draws, says Paul, is there is ‘no last bus’. Despite no service changes being introduced, Stagecoach is still working on further improving the Oxford Tube. It is putting into place some enhancements to its website to make it easier for passengers to buy tickets for the service online. However, Paul emphasised it is not trying to be another megabus.com, it remains a turn up and go service; passengers can still pay the driver. The initiative is just another part of the company’s work towards creating more ways to pay, with the introduction of smart ticketing last year being a part of that. Other ways Stagecoach has improved marketing for Oxford Tube is by using Twitter. To mark the introduction of the new fleet, Oxford Tube launched a competition encouraging the public to tweet #CoachWithAView. Winners, who had been drawn at random, were invited to go on the inaugural trip of the new coaches to London for afternoon tea at the Grosvenor Hotel in Victoria, London. This free trip took place on the day of the launch. Oxford Tube and Stagecoach in Oxfordshire used the special occasion to announce their involvement with the local Helen and Douglas House charity, which has been chosen as Oxford Tube’s charity of the year. Staff members nominated and voted for the organisation to become their charity of the year and have committed to focus all of their fundraising efforts on the charity for the year ahead. Oxford based charity, Helen House opened in 1982 as the world’s first children’s hospice. Douglas House opened in 2004 specifically for young adults aged 16-35. 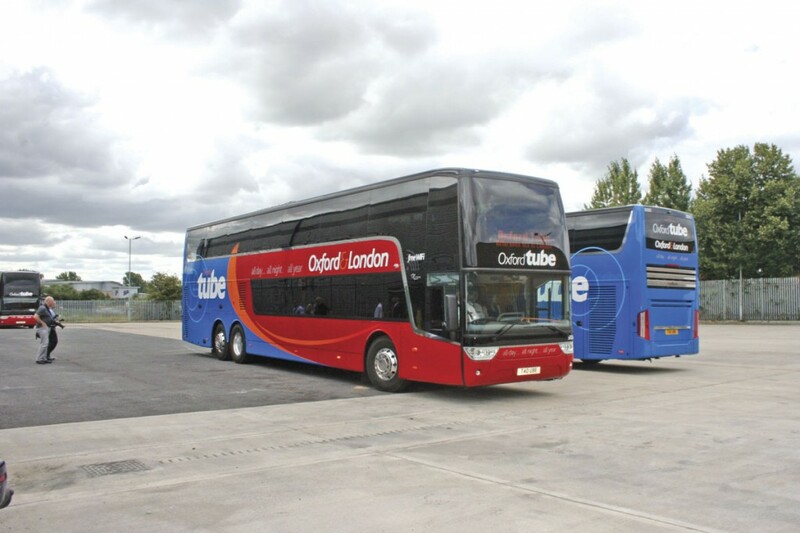 Oxford Tube not only handed over the first cheque which will buy a special waterbed for children so they can both feel and hear music, but they also donated 14 seats on the inaugural coach trip to London for volunteers of the charity. Hugh Thompson from Helen and Douglas House, officially launched the new fleet along with Martin Griffiths and Martin Sutton. During a speech at the launch event, Martin Sutton said the new Van Hools may look exactly the same as the previous vehicles, but they contained many improvements, with new technology and features. These enhancements were brought about in response to what customers said they wanted. He emphasised their clean engines, saying they meet even cleaner emission standards than the Oxford LEZ requires.